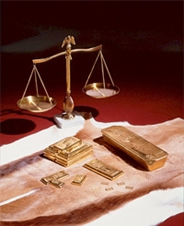 Facts About Precious Metals What is the color of pure gold? Gold changes color when it is alloyed. Increasing the copper content makes the alloy reddish and increasing the silver content makes it whitish. So, do you know the true color of pure gold? Though the word gold is often used to indicate the color of gold, actually pure gold has no true color. The color of pure gold looks different depending on each person's preference as well as the effects of lighting. If you have a gold bullion or gold coin at hand now, please examine it closely. Pure gold may appear reddish at times and greenish at other times. It may sometimes appear yellowish as well. Each time you look at it the color is different. When we launched a project to create for the first time a pamphlet for general readers upon the loosening of regulations relating to gold, we encountered a problem. When we attempted to photograph gold bullion, its color changed depending on the amount of light and slight differences in the camera angle. We wondered which color we should use. After much thought, we brought some of the developed photographs to relevant parties in our company and together they finally decided by majority vote which color should be used for pure gold. In fact, we still use the color standards defined at that time for selecting the color of gold for our publications. 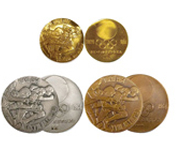 In 1962, two years before the Tokyo Olympics, the Tokyo Olympics Fund Foundation asked Ichiro Tanaka, the second president of our company and the president of the Precious Metals Association, to fabricate the Olympic commemorative medals. The president readily agreed to the request and was excited about the project. Unfortunately, he suddenly passed away in 1963, and Junichiro Tanaka, the third president, succeeded to the business. In October of the same year, Junichiro Tanaka took the first step toward fabrication by establishing the Tokyo Olympic Commemorative Medal Association.The association fabricated blank medals and the Ministry of Finance Mint Bureau marked the design on both sides. The association invited the Bureau to join the project because of its public nature. Three types of medals --gold (18-karat gold), silver, and copper- were fabricated and the sale prices were 5,000 yen, 800 yen, and 200 yen, respectively. On the day of release, people lined up in front of stores, and the medals enjoyed brisk sales as premium items. The first medal fabricated was placed on Ichiro Tanaka’s grave in appreciation of his efforts. Around the same time that the Olympic commemorative medals were released, we received an unprecedented order from a hotel in Izu-funabara. The client requested that we build a bath made of pure gold. The amount of gold required to create such a bath was approximately 140 kg (approx. 490 million yen at the rate of 3,500 yen per gram). At that time, deregulation of imports and exports had yet to be extended to gold, and therefore even preparing the materials was quite difficult work. Surveying the situation, we discovered that while there were gold-plated baths, no pure gold bath existed anywhere in the world. The client wanted to create not just a luxury article, but also a work of art to stand the test of time. In response, we asked Mr. Seibo Kitamura, a leading sculptor and a member of the Japan Art Academy, to design the bath and decorate the interior of the room for the bath. Four months after the start of fabrication, we completed the bath. Before being delivered to the client, the gold bath was paraded through Ginza, attracting public attention. Despite the bathing charge of 1,000 yen for two minutes, the hotel was flooded with reservations and the bath was full every day. According to the client, it recovered the production cost of 130 million yen (computed at the prevailing rate of that time) in about two years.